Guys. I have BIG news to share. And, I mean BIG in the really exciting sense. Really, really, exciting. Are you ready for this? Okay, here goes. I now have a JOB. Insert pumping of fist and overly excited squeal. And, yes, I do expect you to join me in the pumping and squealing. Come on. No one likes to do that alone. Remember awhile back I said I was volunteering at a psychiatric hospital? Well, they officially hired me on. You are now looking at (or, technically listening to) the newest addition to the Admitting department. Whattt? High fives all around. I’ve been training the past two weeks—hence the lack of new recipe postings—and am honestly, really happy about working at this facility. I officially feel like a big kid now. 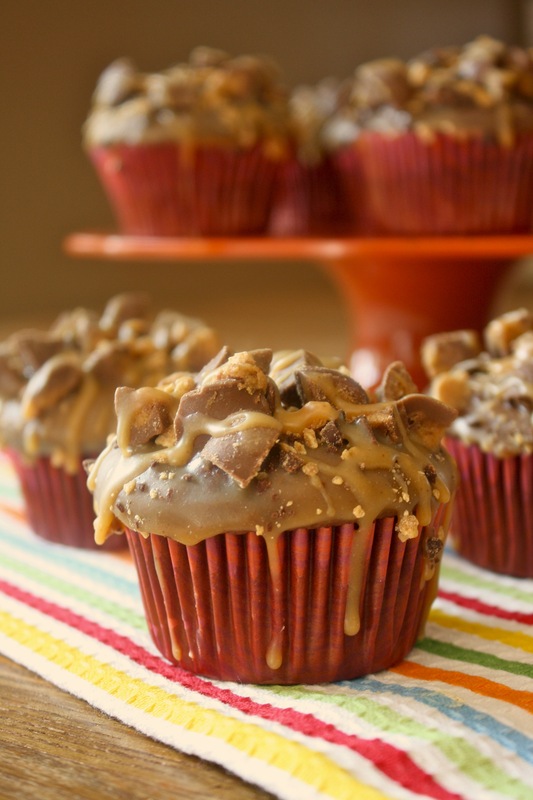 Anyways, speaking of recipes, lets talk about these cupcakes. Nabisco came out with a new Oreo flavor. For the record, I’d like to state that this is the BEST flavor in the history of Oreos so far. 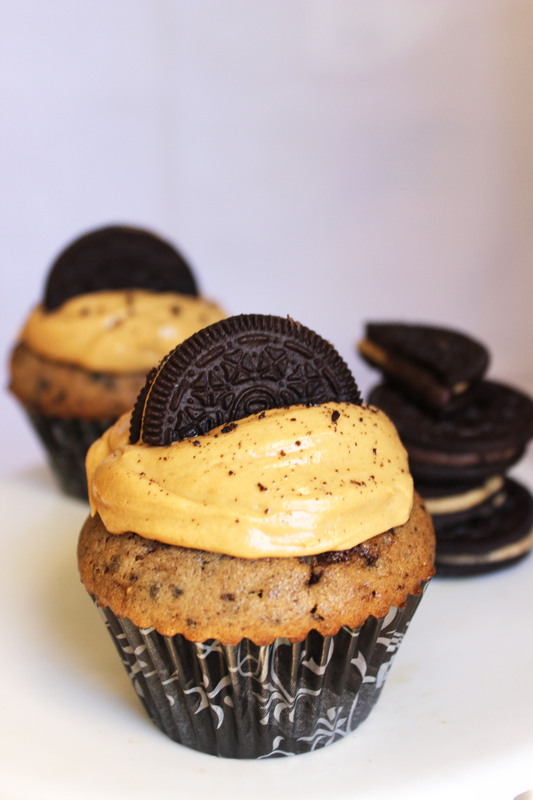 I introduce you to Reese’s Peanut Butter Cup Oreos. There is now REESE’S PEANUT BUTTER CUP OREOS in the world. REESE’S. PEANUT. BUTTER. CUP. OREOS. I really don’t know why I’m capitalizing everything today or, repeating everything for that matter, so just bear with me please. These Oreos are like a dream come true. Let’s rewind a bit here. So, for those that don’t know, I like Oreos. And, I love love love peanut butter. And, my favorite way to eat Oreos is to smother them with a heaping spoonful of peanut butter, and then, of course, drink some milk. Seriously, it’s the most delicious thing in the world. Go try it if you haven’t. Okay, back to dreams coming true. These Oreos taste exactly like smothering a plain Oreo with peanut butter. That is in no way an exaggeration either. Scouts honor. 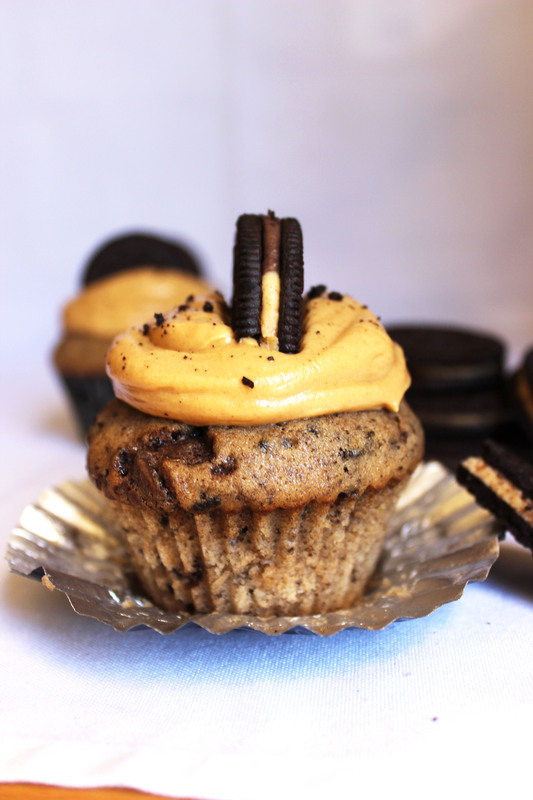 You know what else tastes just like smothering a plain Oreo with peanut butter? Yup, you got it. I see it rolling off the tip of your tongue. 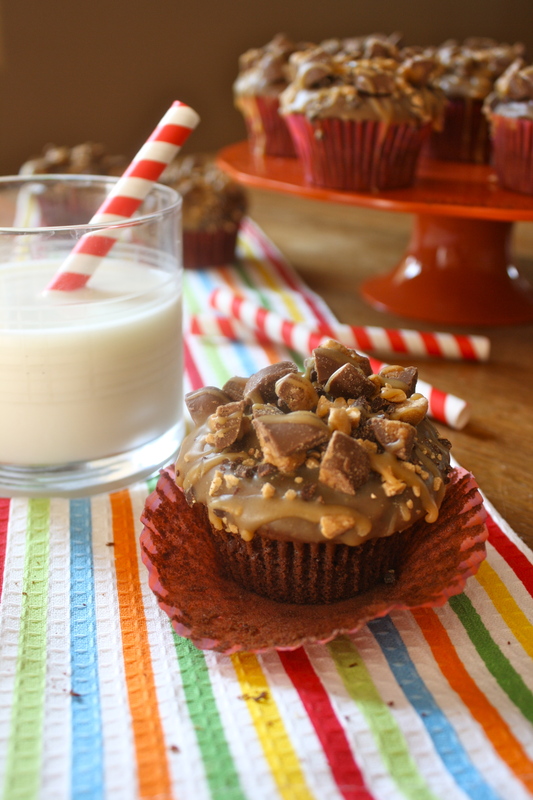 The answer is these cupcakes. 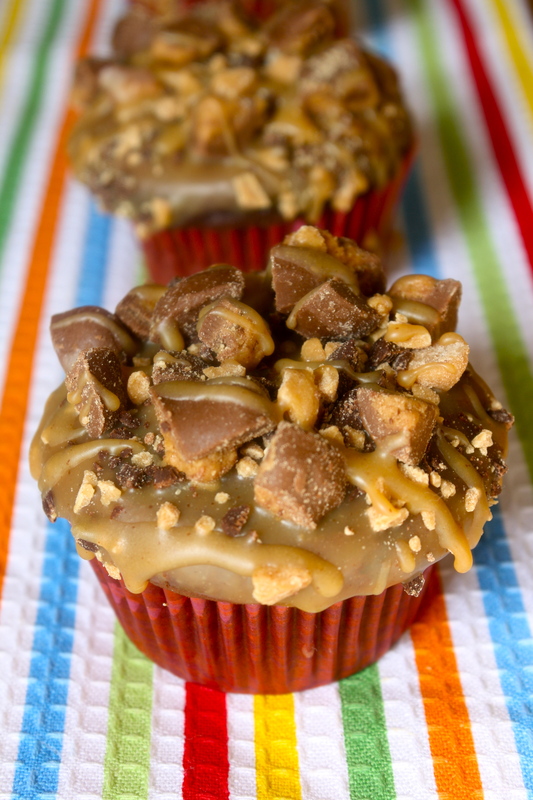 These Reese’s Peanut Butter Cup Oreo Cupcakes. Just look at these little beauts. 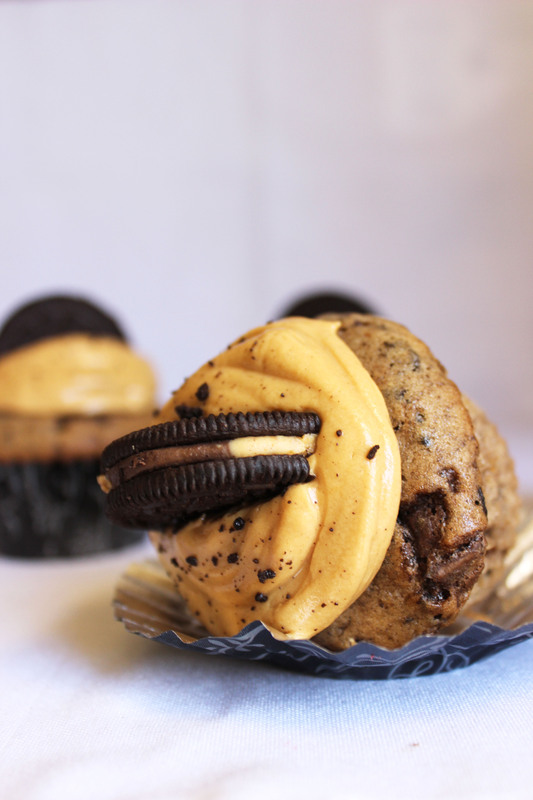 The cupcake itself is a vanilla cupcake that is super moist, super fluffy, and packed with crushed up Reese’s Peanut Butter Cup Oreos. 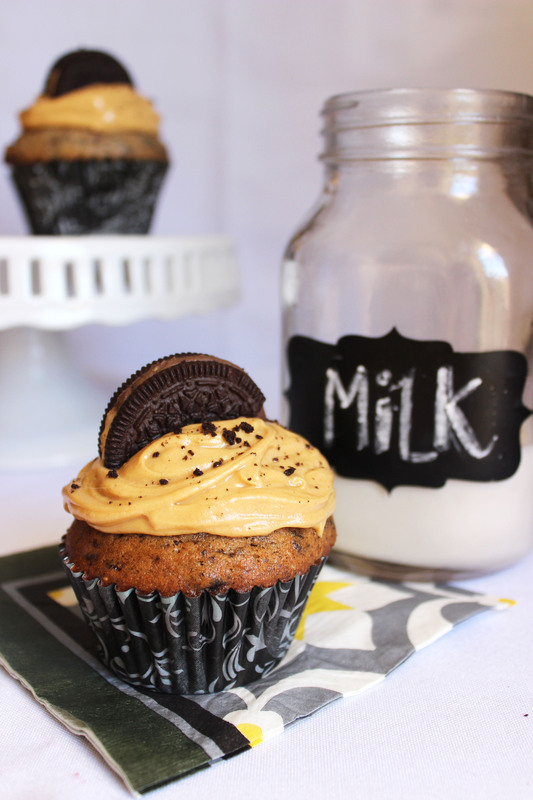 The cupcake is then topped with a creamy peanut butter frosting—I dare you not to eat it out of the bowl with a spoon…seriously, it’s impossible to stop—and decorated with half an Oreo and some crumbs. 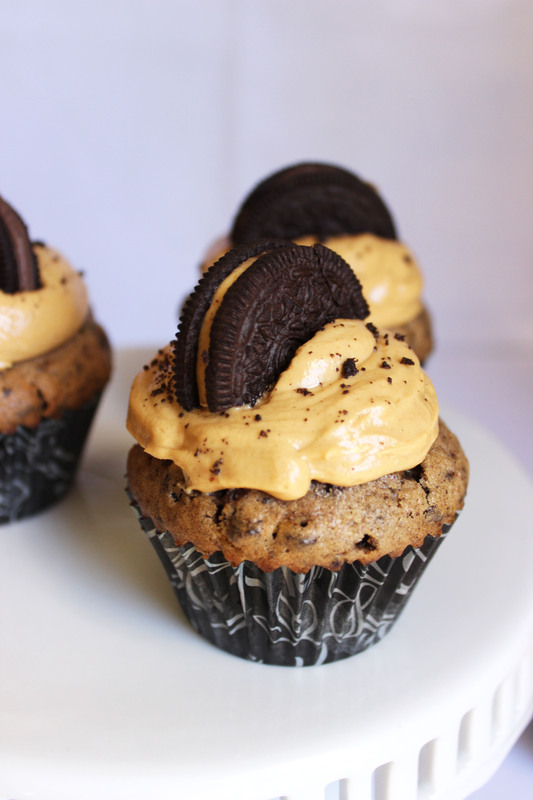 If you like peanut butter and Oreos then you must need to should definitely make these cupcakes right away. Make sure you have a cold glass of milk next to you too. Trust me, you’re going to want it. Preheat oven to 350 degrees, and line a muffin tin with 12 cupcake liners. Set aside. In a large bowl combine flour, baking soda, baking powder, and salt. Set aside. In a medium microwave safe bowl, melt the butter. Whisk in the sugar—the mixture will be very thick. Add the egg whites, whisking until incorporated, and then the greek yogurt until just combined. Add soy milk and vanilla. Whisk until mixture is uniform in texture. Slowly whisk the wet ingredients into the dry ingredients until combined and no lumps remain. Using a spatula fold in the chopped Oreo pieces. Divide batter between the 12 cupcake liners—about 3 tablespoons per each—and bake for 21-23 minutes or until a toothpick inserted in the center comes out clean. Let cupcakes cool completely on wire rack. 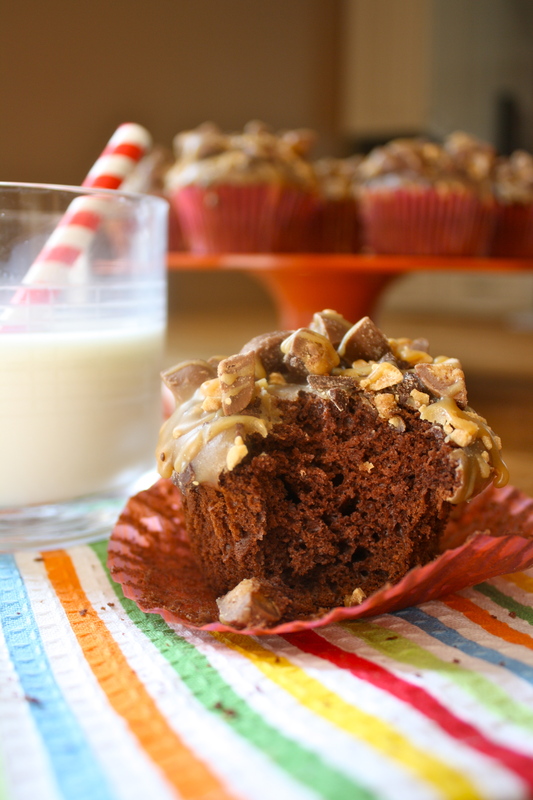 While cupcakes are cooling, start making your frosting. In a medium bowl beat together peanut butter and butter on medium speed until creamy and smooth. Add powdered sugar and vanilla. Mix until combined. Add heavy cream. Beat until incorporated and frosting looks creamy. Frost cooled cupcakes with a piping bag or smooth frosting on with a knife. 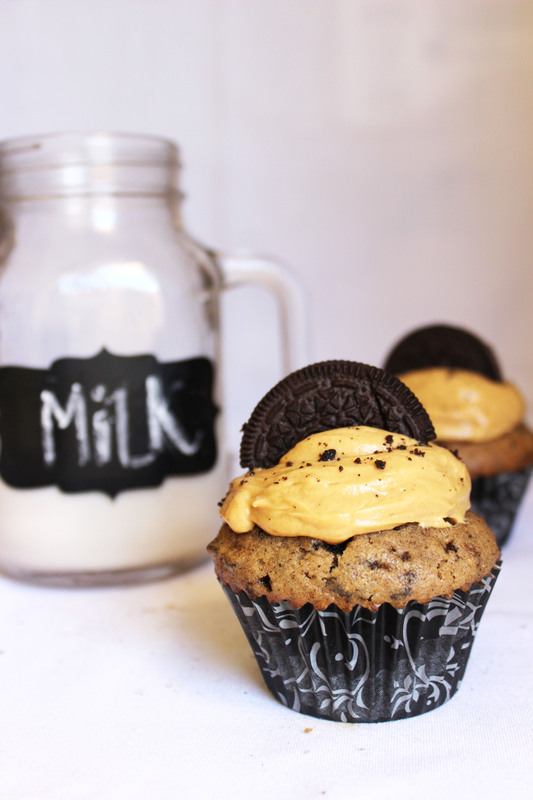 Decorate with Oreo halves and Oreo crumbs before serving.